One interesting fact about our nearest star, is that it's not just a single star, it's a multiple star system – two stars as bright as our Sun, revolving around each other, plus a small star called “Proxima”, lying a little further from the two. The other two stars are called "Alpha Centauri A" and "Alpha Centauri B". It takes about 80 years for the two stars to revolve around each other. 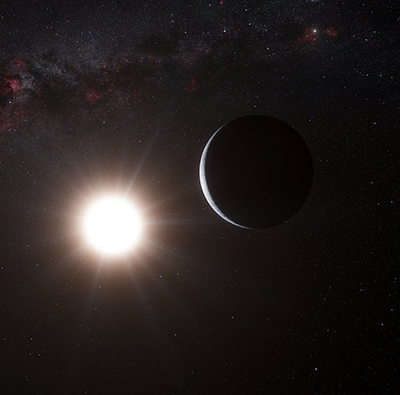 This star system is located some 25 trillion miles from us, which is 6800 times farther away than Pluto. If we tried creating a scaled model that would contain our Sun, Pluto, and the nearest star system, where Pluto was one foot away from the Sun, the nearest star system would be over half a mile away. Lisle, Jason. Taking Back Astronomy. Green Forest, AR: Master, 2006. Print.